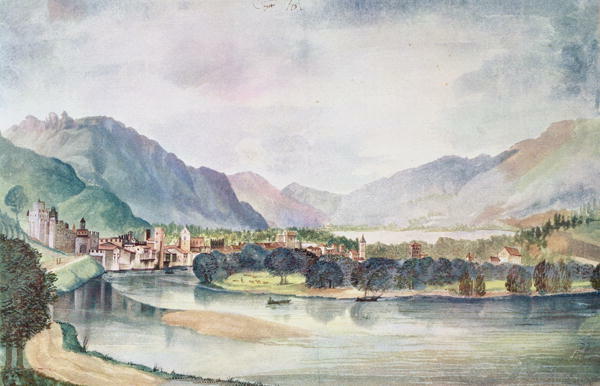 Albrecht Durer’s View of Trente, 1494 (watercolour with gouache on paper) is a good example of aerial perspective. Unlike some of his other paintings the fade out of the mountains in the background is a bit More subtle. Being up by the Meekong River examining this painting was helpful as it is relevant to the scenes that I was sketching. 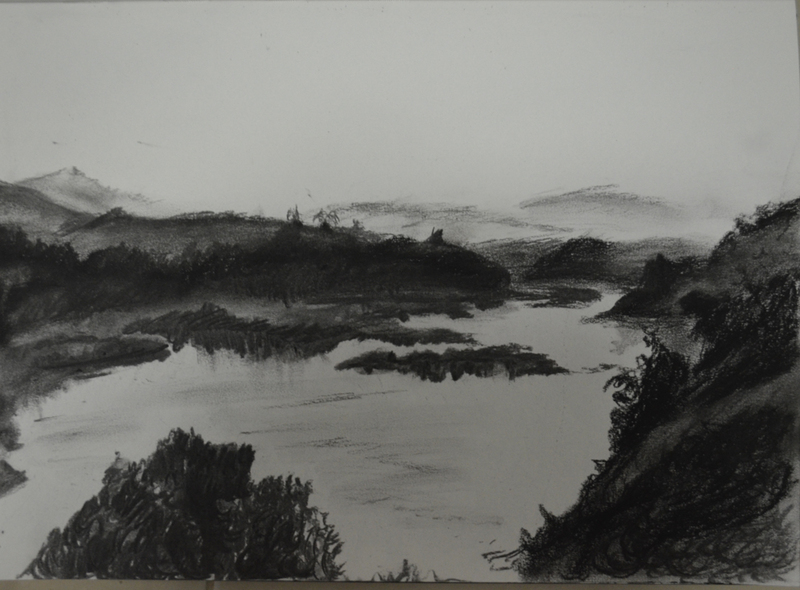 These two sketches were part of a series of sketches that I made up in Chiang Khong and one of three charcoal sketches drawn by the Meekong river on the border of Laos and Thailand. This one here show a lot of promise, I especially like the way the trees accidentally turned out to look like two dogs playing but there isn’t much of a fade out in the mountains in the background, which would be better for this exercise. 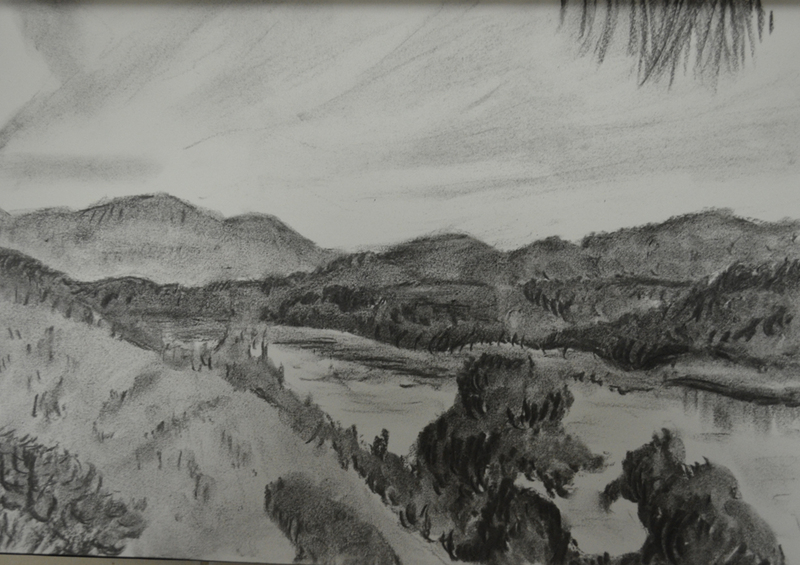 This sketch, although drawn on the same morning and not long after the last one one looks a bit more mysterious, probably because the way I drew the mountains in the background makes it look misty. This was the main reason why I chose to develop this for the final painting. I was hopefully that the photos that I took while I was up there would help me with the colours of the trees and the sky as there were no photos taken of this actual area. Like the finished piece in the Hard or Soft Landscape exercise I finished this one up in back in my apartment in Bangkok. After the first sitting it started to look very different to the sketch. The horizon was the same height and I couldn’t quite put my finger on why it looked different, not realising that it was because the trees and mountains on the left weren’t as deep. This wasn’t a problem for me and it actually .gave the scene more height and distance so I continued to let it take on a life of it’s own. By the time I got the sky and the detail of the trees painted, it began to look even better than I expected. 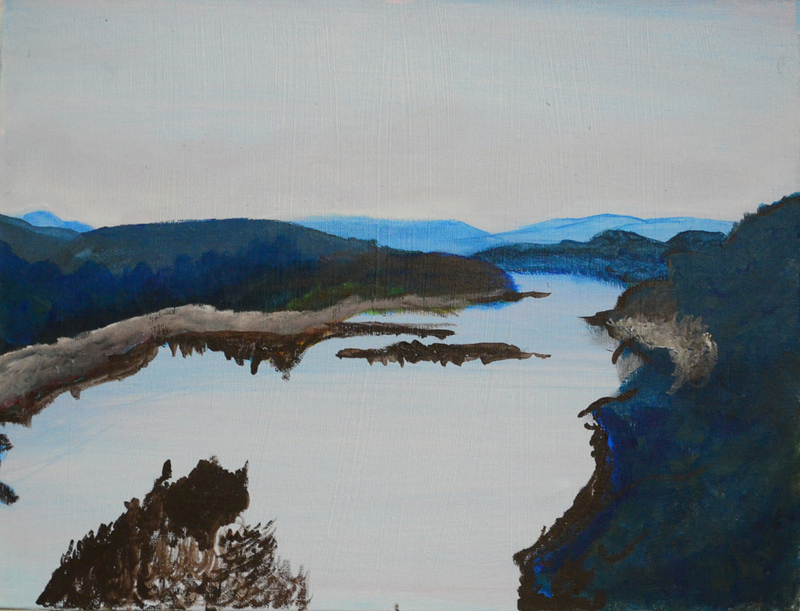 Painting thin washes of blue and white at the bottom of the trees helped me to depict mist on both sides of the river and I used the same scrumbling technique as I did in the Hard or Soft Landscape painting for the sky. Painting the clowds horizontally looked like they were (I think) lifting up in layers from the mist in the distance. I’m not sure if I did a good job painting the mangroves in the foreground and I did go a bit wild with the solitary tree bottom right but the idea was to give them a lot of colour compared to the mountains and trees fading out in the background. 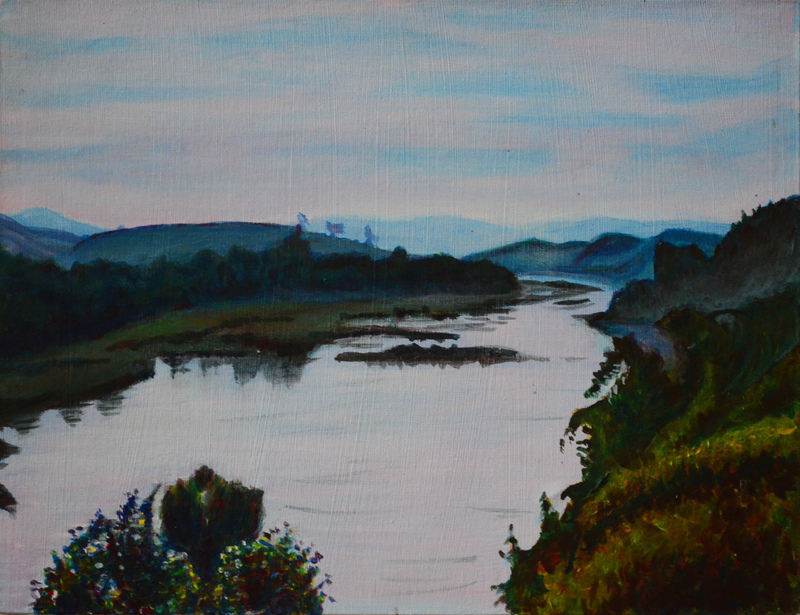 This entry was posted in 2 - Aerial Perspective, 3 Perspective, Coursework, Pt 4 - Looking Out and tagged acrylic landscape painting, aerial perspective, aerial perspective painting, laos, meekong river, oca painting 1, painting in acrylics, Practise of painting, thailand on April 15, 2016 by Mark A Smith.